Annah Chakola Ramsey moves easily, be it on a journey through her homeland in India to living and working in Oklahoma, her on the go style is reflected in her art and business model. I met Annah Chakola while wandering around The Girlie Show last fall. There are dozens of artists at The Girlie Show, but something about Annah’s booth, Boho Gypsy, kept drawing me back. From the colors and materials she uses to the stories behind her creations, it was all too easy to get hung up just looking around her tables at all the neat items that were so artfully arranged. Originally from India, Annah moved to the United States at 16 to pursue higher education. After graduating from the University of North Texas and traveling the world for a bit, she eventually ended up in Oklahoma, which is where her husband’s family is from. She’d worked with the City Arts Center and in arts-related fields before deciding to move forward with opening her own business. At one point she had a store front called the Mango Tree where she sold her jewelry and other accessories, but as any free spirit knows, wanderlust is a siren who’s song never stops. Thus maintaining a constant presence at a brick and mortar store had its obvious drawbacks. Annah had to rethink her business model. The end result is the Boho Gypsy. Annah doesn’t maintain the store front anymore, now she books what are known as “trunk shows.” If you’re not familiar with these, they are jewelry shows where the artist comes and sets up shop for an evening in someone’s home or boutique. But Annah doesn’t just set her wares out; rather, she treats each event like an art installation. With a collection of found objects and little curios, she creates a space that is both inviting and full of quirky travel-inspired details. So who is booking shows and/or carrying items from Boho Gypsy? A lot of people. You can find her creations from Norman to OKC and every place in between if you know when and where to look. Stash and Birdie have had Boho Gypsy trunk shows. 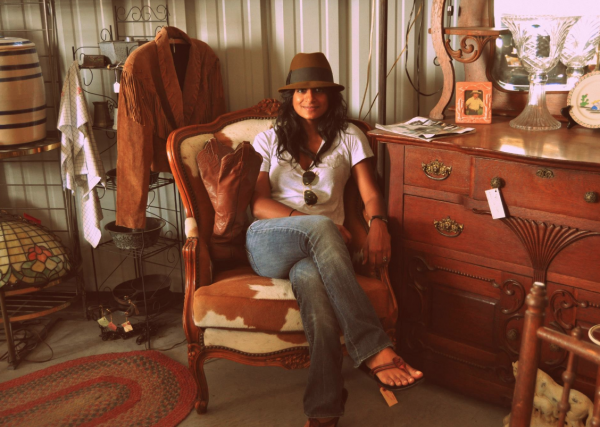 A Date With Iris and Gretta Sloane in OKC are currently stocked with Boho Gypsy items. Annah said that Old Hollywood Moxie, a New York City boutique, also carries her jewelery now too. These are necklaces from Annah's new summer collection which is full of color and texture. The thing I love about Annah’s jewelry or clothing is that it all comes with a story of who she met while on her travels. A trip with her mother through South East Asia helped inspire the items I found at The Girlie Show last fall. A Thai clothing designer Annah met while at small textile fair led to a fruitful partnership in creating a unique cotton shrug, similarly she has contracted the services of other small business owners to help produce her designs. To that end, everyone Annah works with is paid a fair wage. The price is reflected in the cost of her goods, which are not outrageous and range anywhere from $15-$450. 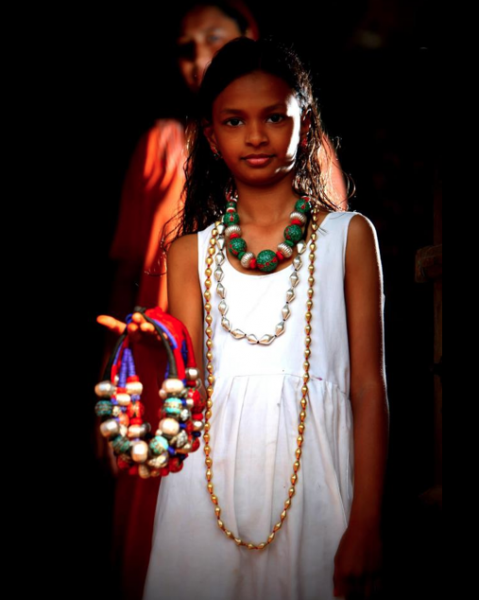 Going through her catalog, it’s clear the quality of the work and a global consciousness for fair trade is what drives at least half of Boho Gypsy forward. Naturally the other half would be Annah herself. Not one to bother people while they browse, Annah typically hangs back unless someone asks her about a piece. Questions range, but Annah said there are times when the topic of conversation wanders off to the places she’s been and how they inspired the creation of a bag, a piece of clothing, or some other trinket. It’s worth noting that Annah went to an international boarding school in India, (a Harry Potter-esque experience, she said, as the building dates to the British colonial period and from what Annah says of the place, it’s just as charming.) Her last trip, taken earlier this year, was to Jaipur, the capital city of Rajathan. The colors from this part of the world are bright and bold. Annah said the theme of her new collection is Indian Kitsch, which was the influenced by the sights and sounds of Jaipur. Another thing I love about Annah’s social media posts and blogging: she documents her travels and the people she meets like a one-woman National Geographic. This Saturday May 12th, which is just in time for Mother’s Day, she will have another show at A Date With Iris, located 4201 N. Western Ave in OKC, which runs from 11am – 4pm. Tagged Annah Chakola, Annah Chakola Ramsey, Boho Gypsy, City Arts Center, Facebook, India, Mango Tree, Mother Day, OKC, Old Hollywood Moxie, South East Asia, space, United States. Bookmark the permalink.